We've seen some pretty gruesome footage from the serial killer thriller Maniac starring Elijah Wood. When the film premiered at Cannes last year, an uncensored trailer made it online, and a red band international trailer showed off more gore last fall. Now the film is finally poised for release here in the United States and one final red band trailer has emerged for the story of a mannequin store owner who leads a double life as a serial killer with a fetish for scalps. It's definitely different for Wood who is best known for childhood roles and his lead turn in The Lord of the Rings, so it should be worth seeing. Watch! Just when the streets seemed safe, a serial killer with a fetish for scalps is back and on the hunt. Frank is the withdrawn owner of a mannequin store, but his life changes when young artist Anna appears asking for his help with her new exhibition. As their friendship develops and Frank's obsession escalates, it becomes clear that she has unleashed a long-repressed compulsion to stalk and kill. Filmmaker Franck Khalfoun (P2, Wrong Turn at Tahoe) directs from a script by Alexandre Aja (Piranha 3D) with Nora Arnezeder playing Anna. 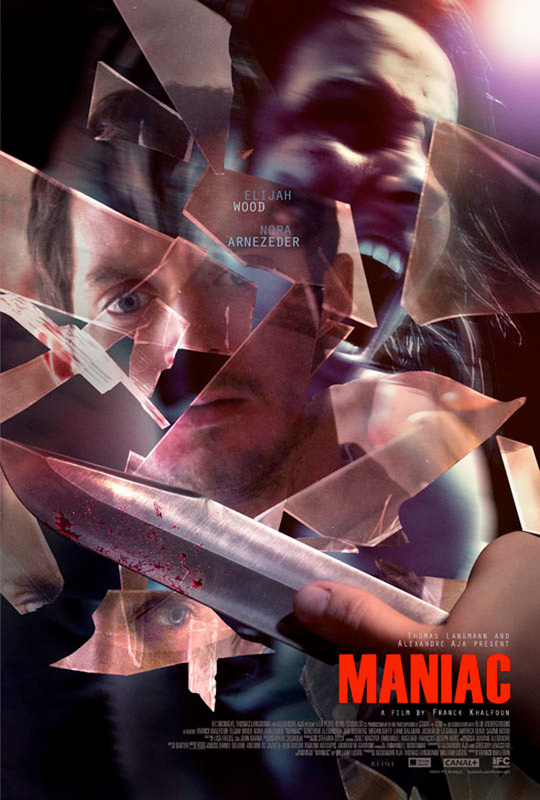 Maniac has already hit some theaters overseas, but IFC Midnight release it in the US on June 21st. Already downloaded 1080p of this and its not too bad. Watched this also, and the first person perspective + shaky camera work gave me a headache. There's also some extremely questionable decision-making from some of the characters that had me face-palming. Both of these combined kinda ruined it for me. First person usually turns out laughably bad in movies, yet this looks like the right subject matter for it. Some of the best films are the ones that make you uncomfortable when they're supposed to, and what could make you more uncomfortable than a movie about a serial killer from the killer's perspective? I guess Frodo kept the ring in this version. Where's Sam when you need him?